It was on June 13, 1966 that the Supreme Court decided that criminal defendants have certain rights when in police custody. Before the 5-4 Miranda decision, suspects could be held for questioning for hours or days without an attorney present or being told that they had a right under the Fifth Amendment to remain silent. The Miranda warnings were extended to juveniles the next year in a separate case. 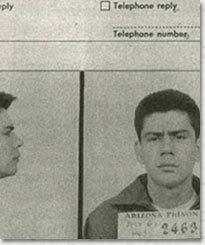 In re Gault (1967) involved a fifteen year-old boy in Globe, Arizona who made a prank telephone call in 1964. At the time, juveniles had few legal rights. They were considered the property of their parents. Gerald Gault was arrested, prosecuted and sent to the state’s school for boys until age twenty-one. The Supreme Court ruled 8-1 that minors enjoy the same rights as adults when charged with a crime. In the Court’s opinion, it was stated that “neither the Fourteenth Amendment nor the Bill of Rights is for adults alone.” Gault’s adjudication as a delinquent was reversed. Take a look at this short article with additional information about the Miranda warnings and its application.